Cyndibands knotted hair ties can be used for more than just securing your ponytail. 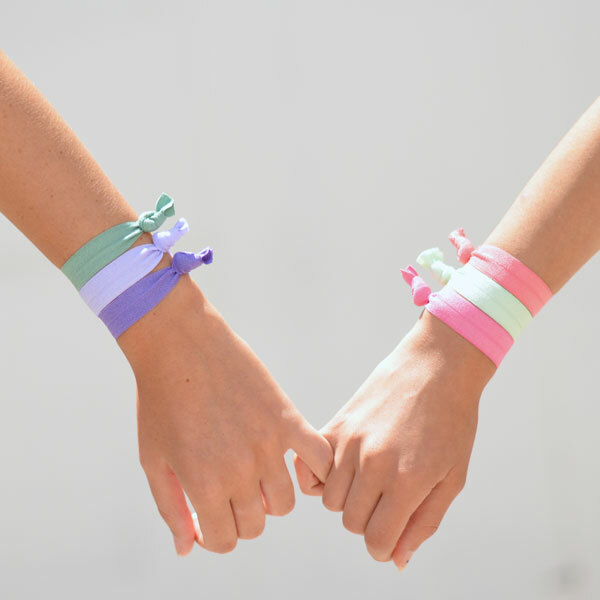 With over 50 colors to choose from, you are able to coordinate your hair tie color to your ensemble, creating a flawlessly fluid style. Using a Cyndibands hair tie not only keeps your hair in the ponytail that you want, but allows your hair to look just as fabulous before and after your ponytail with our gentle no-dent fabric. Wrapping a Cyndibands Hair Tie around the bottom of a braid is a perfect, colorful way to top off this new trending style. When taken out, the hair tie will have left little to no dent or crease like other hair ties, and will allow for the braid to fall out into loose waves with no crimp at the bottom of the wave strand. Keeping a bun of hair securely fastened to the top of your head is an easy feat for Cyndibands hair ties. Sock buns go from a complicated mess to a simple accomplishment in just seconds. Use a flexible hair tie from our neutral colors to go incognito under your wrapped hair. The convenience of a hair tie in a design that doubles as a bracelet! Wear your Cyndibands hair tie as a bracelet and match it to your outfit. With over 50 colors to choose from, this bracelet can match your outfit, no matter what your style brings to the table.